The media in Central Asia has been intrigued by the story that a group of Muslim clerics in southern Tajikistan have spent their congregations' weekly donations on fixing a statue of Lenin, the leader of the Bolshevik Revolution that imposed 70 years of atheism on their country. 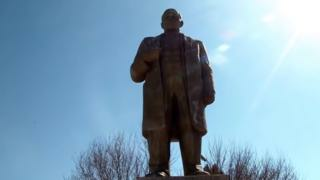 The imam-khatib prayer leaders of the mosques in Shahritus spent the collection money on putting the statue of the Russian Communist leader back on the plinth in the town centre, from which he was unceremoniously toppled two years ago, Radio Liberty's Radio Ozodi Tajik Service reported. The statue has also been repainted gold, and a missing hand has been replaced. Mehriniso Rajabova of Shahritus Council said the imams had come up with the idea themselves. "They repaired the statue, and had the park around the monument cleaned up, as well as having the fountains fixed," she told Ozodi. One imam who spoke to Ozodi was coy about the total amount of money spent, but did say each mosque took about $100 (£77) a week in donations. The Shahritus Lenin was put up under Soviet rule in 1980, and was the tallest in the whole of southern Tajikistan. After independence 11 years later, the country saw most major statues to the founder of the Soviet Union pulled down, but this monument was deemed to have historical value and so survived the cull. That is until 2016, when the local authorities caught up with a new wave of replacing Soviet-era statues with those of Tajik national heroes from the pre-Russian past. They shipped their Lenin off to the village of Obshoron, where it languished in a builder's yard. The imams did not explain why they funded Lenin's return to Shahritus, but the town-centre plinth had remained empty for more than two years since his demotion. The saga has prompted a wide range of reaction on social media, with many comments expressing incredulity. "They aren't clerics, they're idol worshippers," complained one writer on Ozodi's site, while others said the money could have been spent "on helping the poor". But some were quick to compare Tajikistan's current state unfavourably with living standards under Soviet rule. "They did the right thing. If it had not been for Lenin, all Central Asians would be illiterate like in Afghanistan," wrote 'Muhojir'. There were also users who said it was simply better to acknowledge the country's past. "Leader or not, this is our history, and our children need to know it," read one comment on the Ozodi news site.